Best items to buy with the discount! The Sephora sale is back starting tomorrow for Rouge members! I’m actually not Rouge this year – thumbs up for not spending $1k in the past year, but I am sadly missing the 20% discount. As a VIB member, I get 15% off starting next Thursday, August 30th. Beauty Insiders get 10% starting next week as well. To shop online, use discount codes: YESROUGE, YESVIB, and YESINSIDER. Here are some of my very favorite products that are worth a haul. I’ve repurchased most of these, including the Caudalie Sorbet, Drunk Elephant Bars, Bite Lip Mask, Josie Maran Body Butter, and Comptoir Sud Pacifique Perfume several times. Others are recent discoveries that have achieved HG status already, like the Isle of Paradise Drops and Herbivore Prism. Herbivore Botanicals Prism Exfoliating Glow Potion – This is my new favorite exfoliating serum. It has a pretty watery consistency that layers well with other skincare products. I only use this at night and happily wake up the next morning to soft, glowing skin. Full review coming soon, but I highly recommend this. Caudalie Vinosource Moisturizing Sorbet – A wonderful hydrating lotion with clean ingredients. This feels lightweight, helps with redness, and is cruelty-free, vegan, and oil-free. It also smells lovely and the packaging is cute. Sunday Riley Luna Sleeping Oil – Another glow-making product! This is a hydrating and anti-aging overnight oil that replaces moisturizer and serum for me. It has retinol for plumping the skin, helping with wrinkles, and smoothing pores. I also love the blue tansy and chamomile ingredients for soothing redness. Drunk Elephant Baby Pekee Bar and Juju Bar Travel Duo – These are so convenient for travel since they’re smaller and don’t count as a liquid. Even though they’re little, these last about six months or longer, so they’re definitely worth the price. The Pekee bar is amazing for gently removing makeup while Juju lightly exfoliates, making it a great morning or post-workout cleanser. Josie Maran Whipped Argan Oil Body Butter – The unscented version is actually my favorite because it smells like whipped cream! This is my favorite body butter ever. It’s so hydrating without being heavy; the whipped formula is definitely light and luxurious. Since you can get a great body butter at Ulta for less than $10, I only splurge on this during the sale. It lasts a few months thankfully. Isle of Paradise Self Tanning Drops – I use the Light version of these drops mixed into body lotion before I go to bed. I wake up a shade or two darker with even coverage and no orange tones. I never thought I’d be into self-tanning (it always seemed so time-consuming and hard to get it to look natural), but this has completely changed my mind. Full review here and routine details here! Ciate London The Pretty Eyeshadow Palette – Out of all of my eyeshadows, this is my ultimate go-to. I use it every. single. day. You can create a very natural-looking matte eye, everyday shimmer look, or add drama for a night out. While it’s a neutral palette, the pop of orange, purple, and gold make it pretty versatile. It’s relatively affordable too and great for travel. BareMinerals Invisible Bronze Powder Bronzer – This is another item I use in my daily routine because it couldn’t be faster to apply and it looks so natural. I lightly sweep this along the perimeter of my face in a 3 shape. The Medium shade is perfect for me, even when I’m much more fair, so you may want to swatch this one in store. The texture/finish reminds me of the Hourglass Ambient Lighting powders; there’s a tiny bit of shimmer that adds a nice, healthy-looking glow with absolutely no detectable glitter particles. Bite Agave Lip Mask – One of the most moisturizing lip balm products I’ve ever tried. It has a thicker consistency that melts onto the lips for a comfortable, plush feeling; this helps it last for a good few hours on the lips. The finish has some shine, but it’s not terribly glossy. Smashed is my favorite shade, but I’ve tried the clear and Champagne versions too. I really want to try the newer Maple and Lavender shades! Briogeo Rosarco Milk Reparative Leave-In Conditioning Spray – Amazing if you have dry or damaged hair! 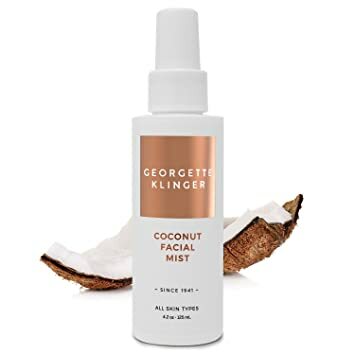 I love a lightweight leave-in that takes care of frizz, protects from UV, and adds a good dose of moisture; this spray does it all while smelling nice. I definitely want to explore more from this brand – they’re pretty clean and cruelty-free too. Verb Hydrating Shampoo and Conditioner – Another great fix for dry hair. This duo helped so much with my curls without being heavy. It also smells great, but it isn’t overbearing. I’m currently using the Ghost Line (reviewed here!) which I’m loving and may be better for my newly short hair. Either way, I’ve loved everything I’ve tried from this brand and it’s already affordable thankfully. Comptoir Sud Pacifique Vanille Coco – This is my favorite warm and sweet scent. It’s not too close to baked goods, but it definitely has some nostalgic vibes in my opinion. Vanilla is my classic winter scent, but the coconut in this adds a tropical vibe that is fun for warm-weather vacations too. Perfume is rarely on sale, so this is a great time to treat yourself or pick up gifts. There are so many products and brands from Sephora that I love (Tata Harper, Hourglass, and First Aid Beauty to name a few), so I couldn’t include everything, but these products popped into my head right away and are so good I HAD to include them. What are your Sephora Favorites?? Anything new you’re picking up during the sale? Posted by@jeansandgems August 20, 2018 August 20, 2018 Posted inBeautyTags: best concealer, concealer, everyday makeup, lip liner, mac pro longwear, makeup bag monday, nordstrom beauty, second chance makeup, tool cool for school3 Comments on Beauty Products I’ve Changed My Mind About!